588: Mike Weingartner is the Head Golf Professional at The Ridge (formerly known as The Ridge at Castle Pines North) just outside of Denver. In our conversation Mike talks about how he gets the most efficient golf swing out of everyone of his students. We also talk about the importance of lag in your swing, why it’s important to focus on your athletic ability to improve your game, and his favorite par3, 4, and par5 holes at The Ridge. 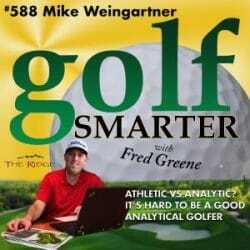 Thanks to everyone who has jumped at the opportunity to download any and all episodes from the Golf Smarter catalogue! Now that we’ve discontinued Premium Access every episode of Golf Smarter, dating back to 2005, is free for everyone. If there were episodes in the past that you heard but it wasn’t a Premium Episode, then chances are you missed at least half of the conversation. Download and listen to all those unedited interviews where ever you download your favorite podcasts.